We have recently added an exciting new feature to the Sendible social media management platform that allows you to automatically send welcome messages to new Twitter followers. These can be automatic DM’s (direct messages) or even @ replies. Sign in to your Sendible account. If you don’t have one, you can sign up for a free trial at http://sendible.com/signup. Click on Add/Edit Services and under Add Services, select the Automation tab. Next to the Twitter Auto Responder, click Add. Description: This is for your own reference. 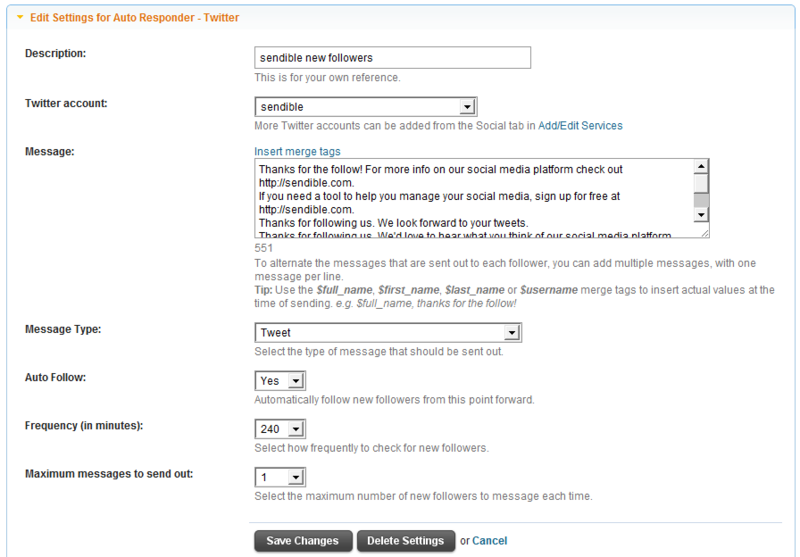 Twitter account: Select the Twitter account that will send the messages to new followers. If you haven’t added a Twitter account yet, you can do this in Add/Edit Services under the Social tab. Message: Enter the message that will be sent out to new followers. To alternate the messages that are sent out to each follower, you can add multiple messages, with one message per line. You can also insert merge tags such as $first_name or $username. These will replaced with actual values when the tweet or DM is sent out. Message Type: Select the type of message that should be sent out. This can be a DM (private message) or Tweet (public @ reply). Auto Follow: Select Yes if you would like to automatically follow people back. Frequency: Select how often Sendible should check for new followers and send out messages. Maximum messages to send out: Select the maximum number of DM’s/Tweets to send out every time Sendible checks for new followers. Once you’ve saved your settings, Sendible will automatically check for new followers based on the frequency you set and will send out DM’s/@ replies to those Twitter users.